Discover the newest coastal gem in Manatee County! Ungarelli Preserve, a lush mangrove oasis located on Sarasota Bay, will open on March 5th, 2016, after four years of restoration work. This 35-acre site is the County's newest “coastal jewel” preserve, one of a network of conservation properties set aside for restoration and preservation in western Manatee County. Come help us celebrate and explore this new site, see the new habitat and recreational improvements, and participate in the dedication of the Joseph Ungarelli Sr. memorial. The event will include a ribbon cutting, reflections on the site by guest speakers, and short nature tours through the new preserve. 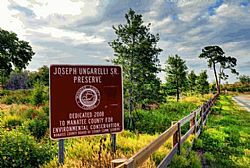 Ungarelli Preserve was made possible by the Manatee County Board of County Commissioners, the support of the Ungarelli family, and grants from the Fish and Wildlife Foundation, Southwest Florida Water Management District, and Ringhaver.